The Legend of Zelda: A Link to the Past kicks off with an introductory sequence unique within the series. It's reminiscent in many ways of the opening mission that would appear in Final Fantasy VII a few years later: A fast-paced lead-in to the game, its story, and its mechanics that moves things along briskly and only gives players a change to rest and begin to soak in the world afterwards. But this late-night journey to retrieve Princess Zelda from a prison beneath her own palace ultimately offers only a fleeting glimpse of the full scope and mechanics of A Link to the Past. It's a mere lead-in that soon unfolds into a proper prologue, one in which players experience a fuller taste of the overall game while laying the foundation for the adventure ahead. The remarkable thing about the expanded prologue sequence that follows the introductory quest is that the development team structured it in a way that, in a player's first time through, makes it feel like it comprises the full extent of the game. The "prologue" to which I'm referring isn't formally designated as such; I'm referring to the portion of the game that falls between sequestering Princess Zelda at the shrine in the woods and Link's return to Hyrule Castle to take on Agahnim. Nintendo's designers cleverly crafted this phase of the game in a way that makes it feel like a full, self-contained adventure, culminating in what appears to the the final boss encounter. The player follows a trail of hints and breadcrumbs across the entirety of Hyrule, completing several dungeons and literally exploring every corner of the world map before collecting the legendary Master Sword and taking on the evil being who has (or appears to have) masterminded the game's events. In truth, you've only completed about a third of the game's tasks by the time you face Agahnim, and you've only seen half of the world-but your tasks are presented in a way that the true scope of the adventure only begins to become apparent as you approach what appears to be your ultimate goal. The original Zelda for NES featured an open world design in which players could venture practically anywhere from the outset. Aside from the final dungeon (which couldn't be entered without collecting a complete Triforce from the eight dungeons scattered across the land) and a handful of places that required the use of a raft or ladder to reach, Link could go anywhere he wanted from the moment the game began. Zelda II, on the other hand, had a more rigid structure akin to that of the Dragon Quest games: Massive portions of the map were gated away to be inaccessible by barriers that could only be passed with the use of special tools and spells. With A Link to the Past, Nintendo split the difference; this version of Hyrule felt largely open, as with the first game, but within the world you would constantly encounter small areas barred by temporary obstacles. It's difficult to say precisely what ALttP's greatest design accomplishment was; it did so many things brilliantly. But if I were forced to narrow it down to a single feat, I would probably point to the subtle interlocking puzzle that was the game world. Even discounting the interwoven connections of the Dark World (which is a topic for a future column), Hyrule in ALttP somehow managed to combine free-roaming adventure with thoughtful divisions and barriers designed to give the creators a certain high-level control over player progression. The prologue phase of the game demonstrates just how extensive, and how seamless, the development team's predetermination truly was. Link constantly encounters walls and blockades that prevent him from exploring certain caves, from acquiring obvious but inaccessible items, and from ranging along every single tile of the overworld at liberty. Despite this, you feel like you've seen the whole of Hyrule by the time you collect the Master Sword. The mandatory flow of the game and the obvious path of NPC hints and suggestions are designed to lead you across the full expanse of Hyrule: You begin just north of the center, at the shrine, before being told to traipse over to Karariko Village to the west. From there, you head to the far east side of the map to meet the village elder, Sahasrahla, and complete the first proper dungeon. With that task complete, your next objective is the dungeon at the southwest corner of the map... though Sahasrahla suggests you check out a cave in the southeast corner first, and in any case you can't enter the second dungeon until you swing by the library south of Kakariko Village. 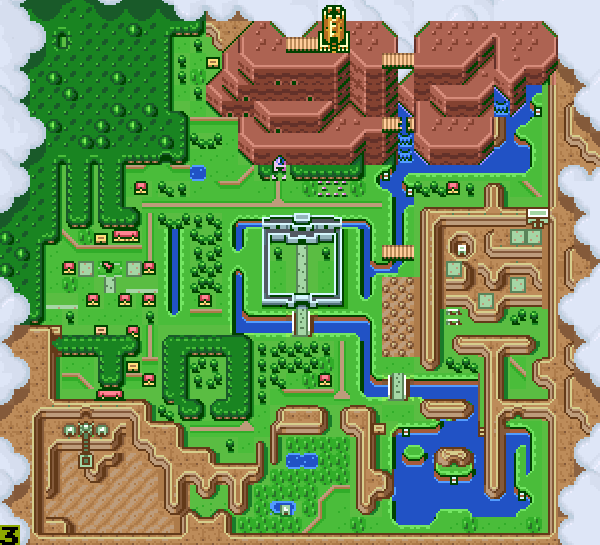 And from there, you have to navigate Death Mountain (to complete the third dungeon) and the Lost Woods (to collect the Master Sword), which together comprise the northernmost quarter of the world map. That accounts for all of Hyrule, really, so your march through the gates of the castle to take on Agahnim (hidden in the sealed chamber you couldn't enter during your opening journey to rescue Zelda) feels like a sort of climax. You've explored the kingdom, conquered the dungeons, beaten bosses, collected medallions, and acquired the legendary Master Sword. Sure, it's a short adventure, but what else could there be left to do? There's so much to find in A Link to the Past. Of course, there are a few giveaways that the quest is far from over. For starters the Moon Pearl, which several NPCs mention in your trek to the third dungeon, seems important. It prevents Link from being rendered defenseless in the Dark World. Yet you never really need to use it to complete the medallion quest; in fact, you can complete the third dungeon without collecting it at all. And during your brief sojourn into the Dark World, you might happen to take a look at the world map and notice it's subtly different now from the map you've been using, but just as large, even if you're stuck n Death Mountain for the moment. And what of that strange glowing structure in place of the Tower of Hera you might glimpse while in that parallel realm? In other words, attentive players probably weren't suckered into thinking the encounter with Agahnim represented ALttP's endgame. Yet at the same time, the medallion quest certainly gives that impression. It spans the whole of Hyrule. It forces players to learn the topography of the land, demands they develop strategies for dealing with enemies, and even gives them clues for how they're meant to properly navigate what will shortly become a profoundly convoluted virtual world. The early portions of the game are dotted with tantalizing treasures hidden in plain sight, and many of them can be acquired before returning the Hyrule Castle. You can snag the Heart Piece on the desert cliff when you venture outside of the second dungeon (which, rather than consisting of a single contiguous structure as in previous games, sprawls across several separate buildings - a design concept that becomes quite prevalent in the main quest's dungeons). You can collect a high, out-of-reach Heart Piece in the Lost Woods by hacking at bushes to reveal a hidden alternate entrance to a thief's lair (again, a skill that later becomes mandatory). And so forth. 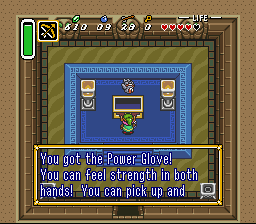 By the time you do take back Hyrule Castle from the wizard's forces, you've developed a firm grasp on Link's capabilities. You've increased his skills and tools and health. And most of all, you've become an expert on the land of Hyrule. All of these factors become essential as you venture into the real meat of the game, because once you destroy Agahnim, the going becomes far more difficult. Enemies hit harder. Puzzles require expert use of tools. And most of all, navigating the intricate interconnections between light and dark worlds demands intimate knowledge of the realm's topography. In a way, Link's quest to defeat Agahnim plays out as a microcosmic version of the original NES Zelda quest, wrapped up in the RPG elements of Zelda II. 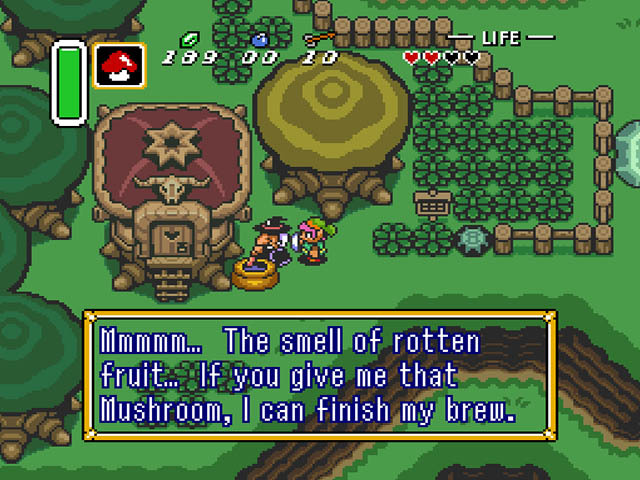 But once ALttP kicks into high gear, the adventure becomes bigger and more devious than the 8-bit entries in the series ever dreamed of being. Next week: A trek into darkness. Tagged with a link to the past,	Analyses,	Classic Deep Dives,	Nintendo,	Retro,	SNES,	Super Nintendo.